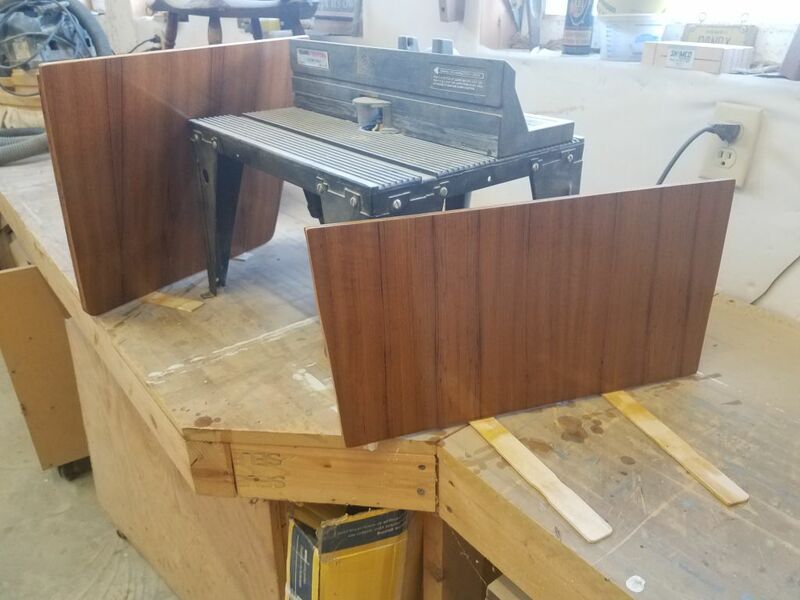 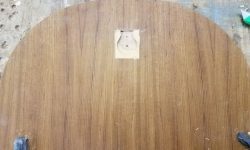 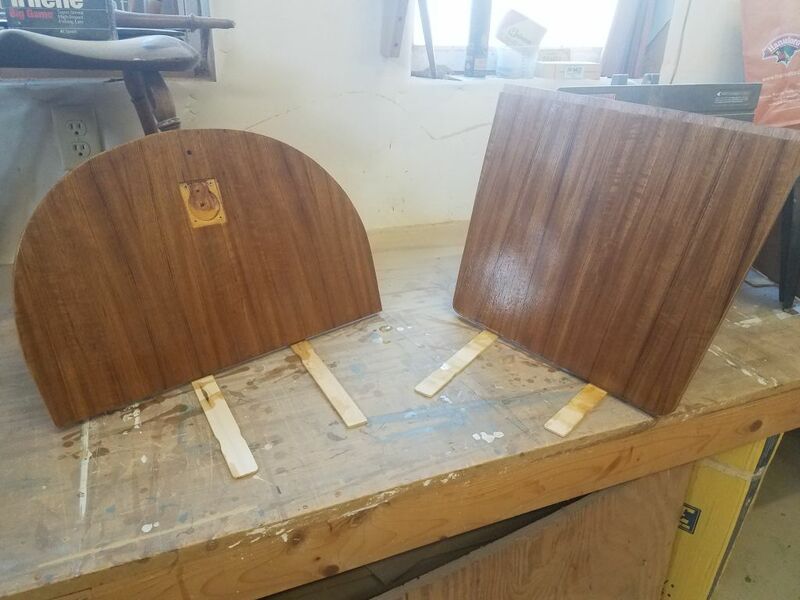 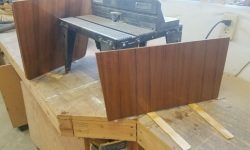 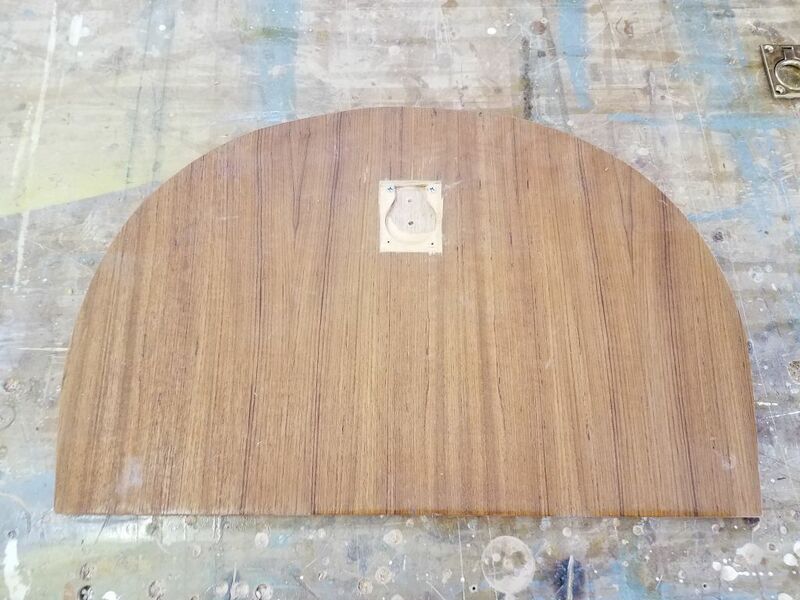 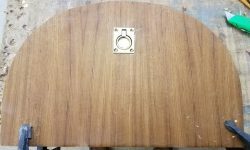 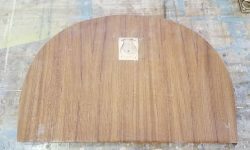 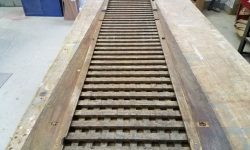 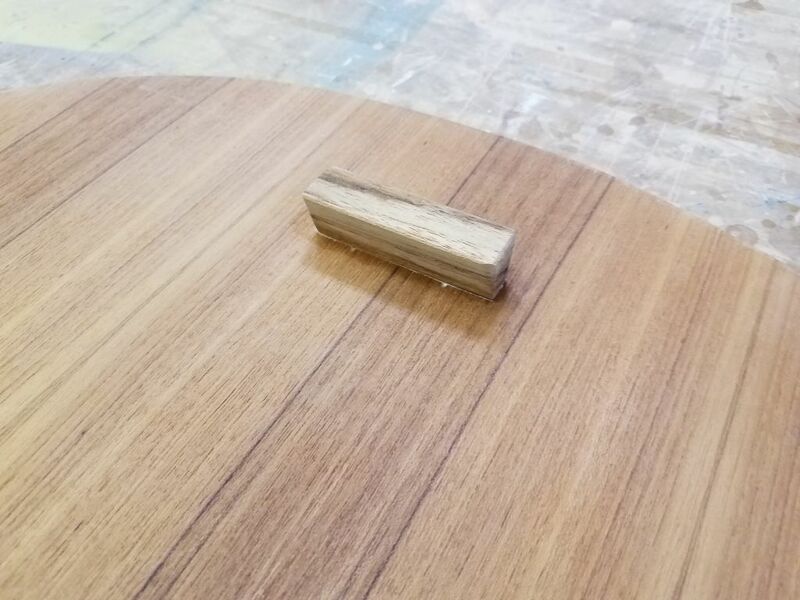 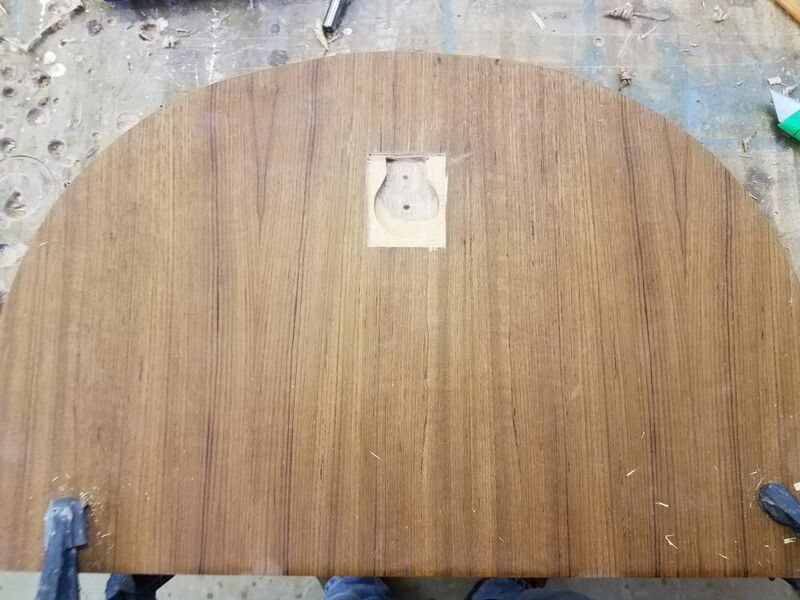 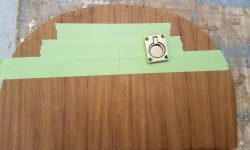 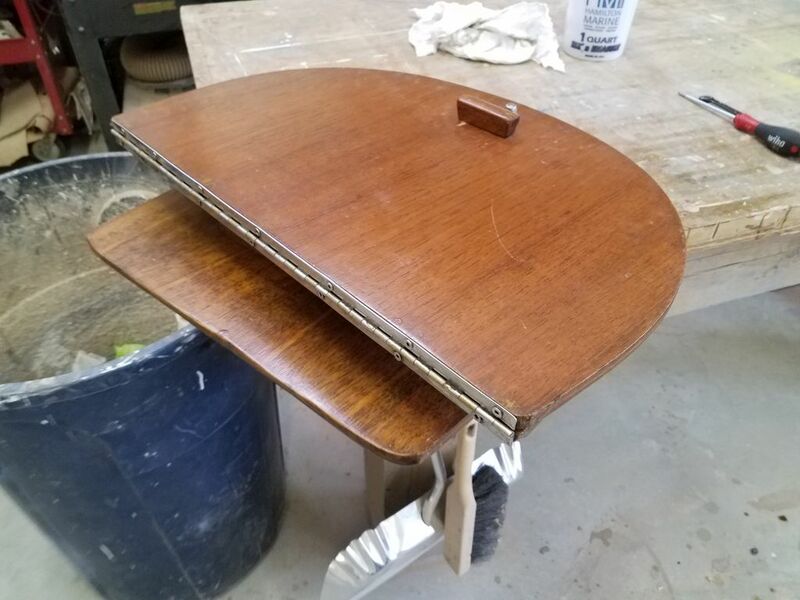 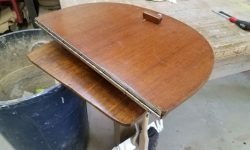 To finish up the new companionway boards, I used the old top board as a guide to measure for and lay out the location for a new ring pull on the new piece, then, with a router, chisel, and large drill bits, relieved the opening as needed to accommodate the flush ring pull. 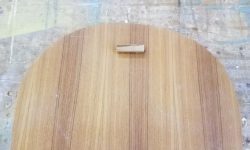 To match the original, I milled a small piece of solid teak for the back side, creating a small handle. 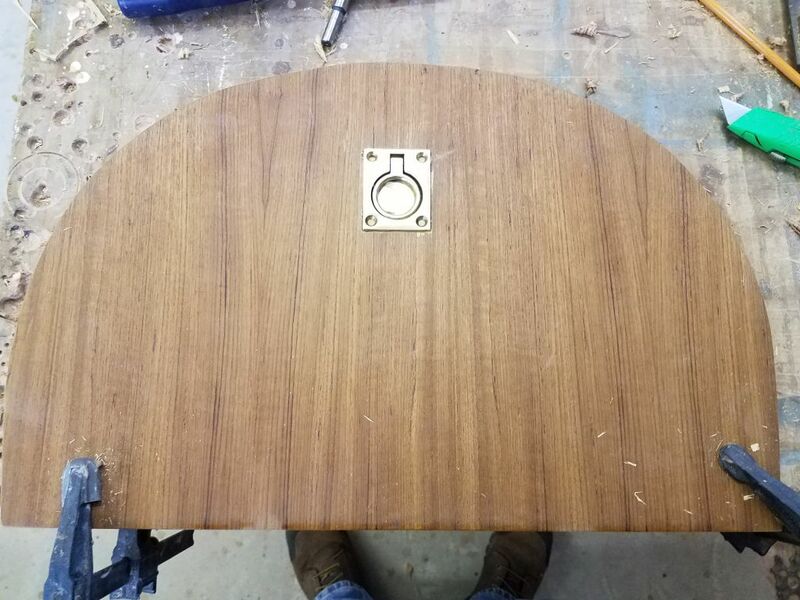 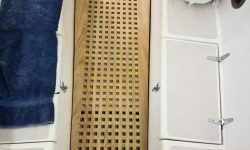 I attached this with glue and temporary screws through the front side, which holes would later accommodate two longer screws to secure the new ring pull. 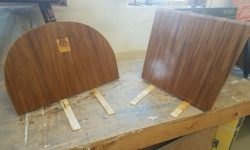 The owner requested that I apply a second coat of varnish to the new boards, so now I did so. 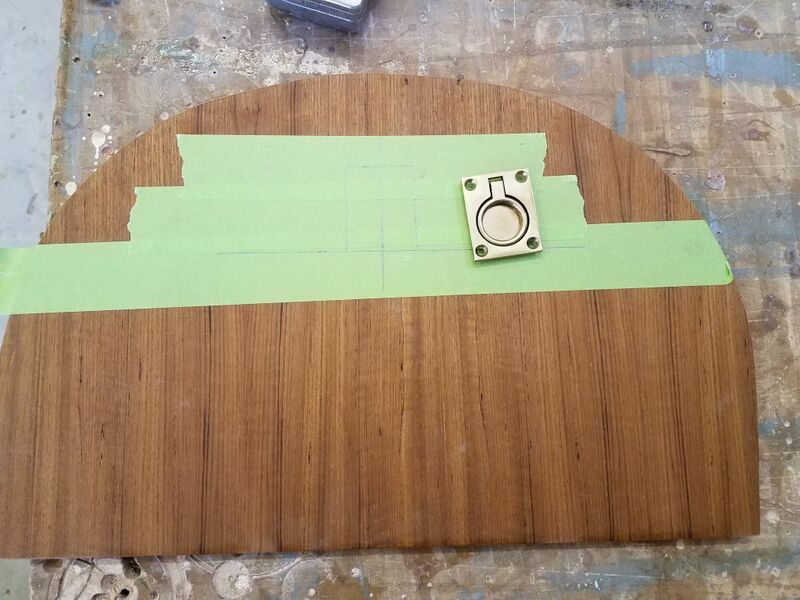 Meanwhile, I reassembled the original set of boards with their original hardware. 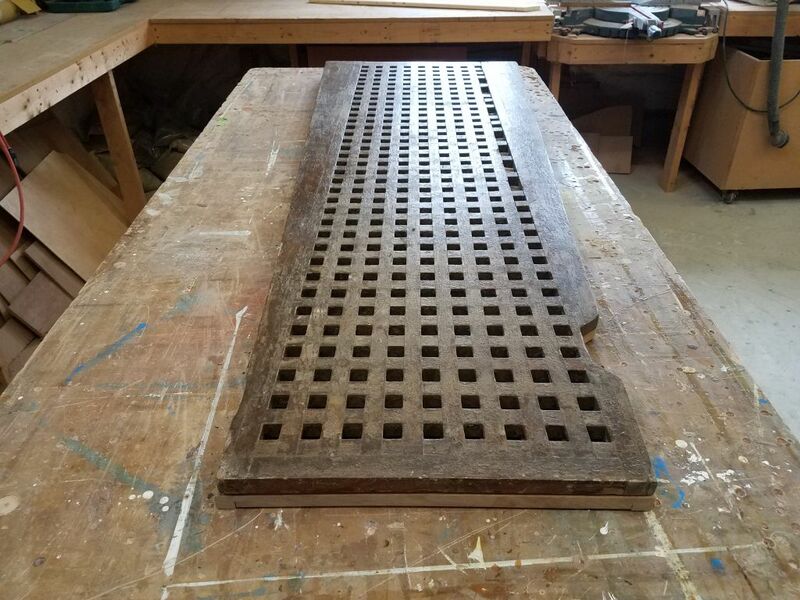 The owner had brought me a new, slightly-oversized teak cockpit grate blank, and requested that I fit it as needed. 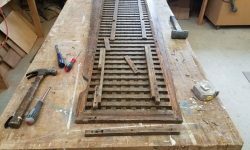 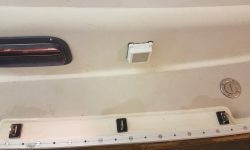 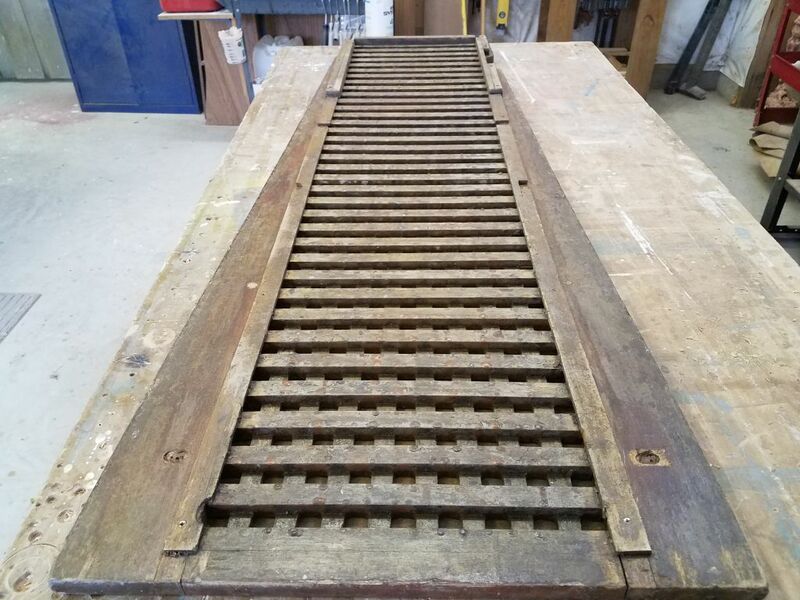 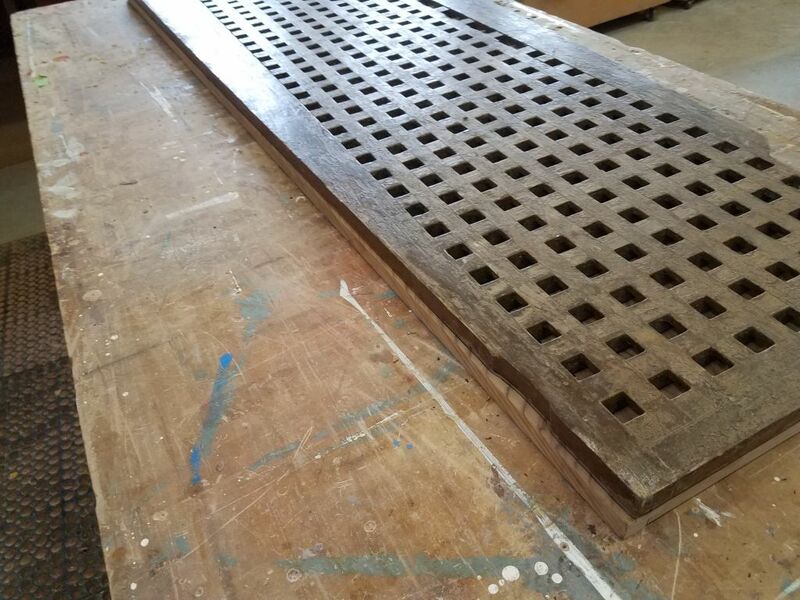 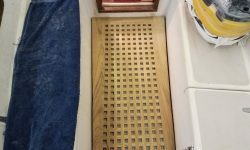 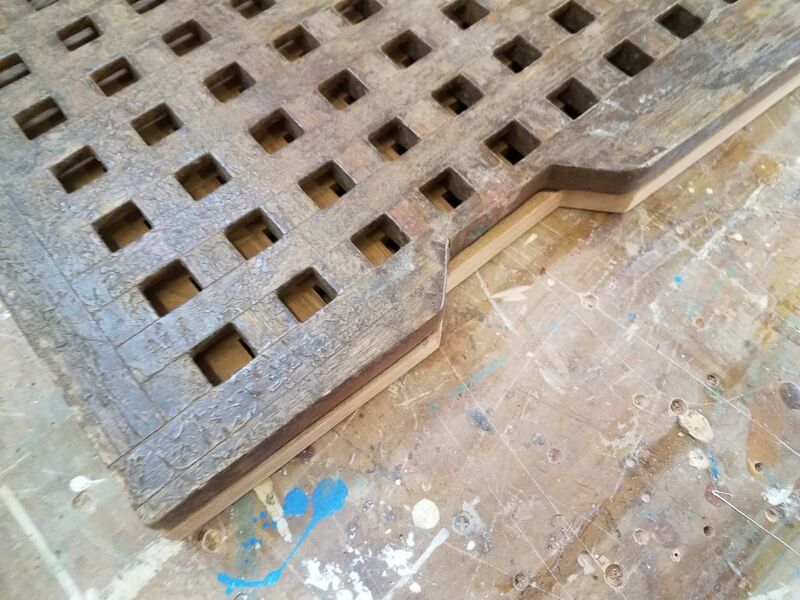 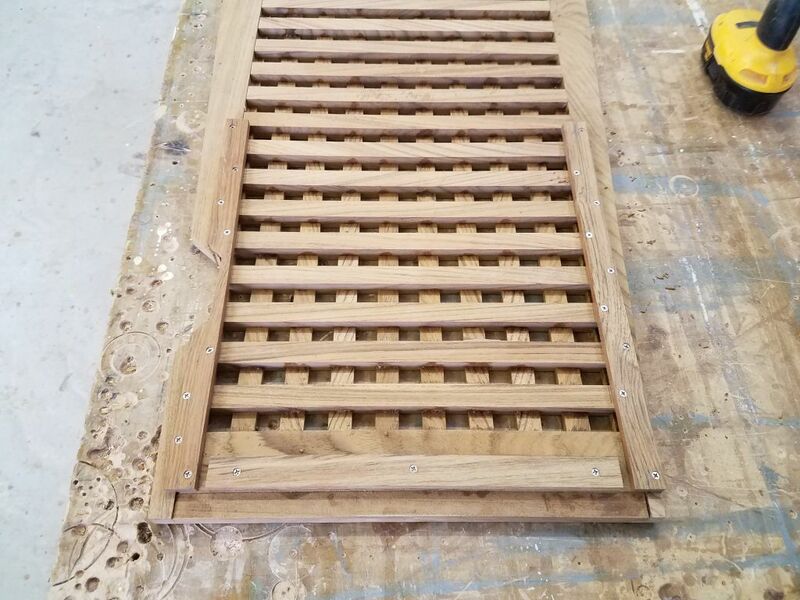 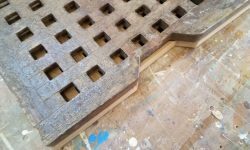 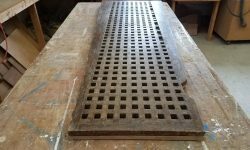 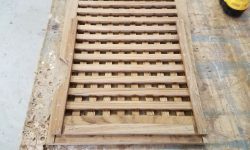 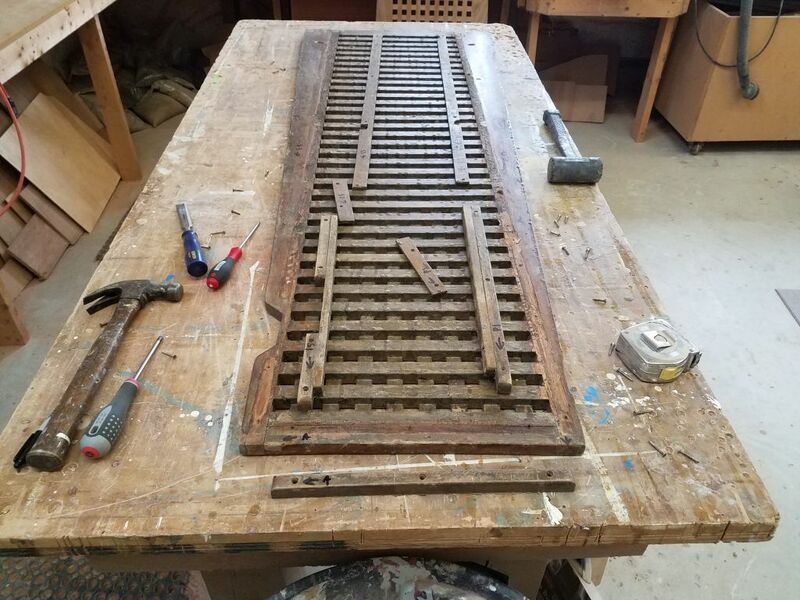 I had the old grate on hand as well, but to use it as a template I first had to remove some cleats from the bottom side so I could lay it flush on the new grate for marking and trimming. 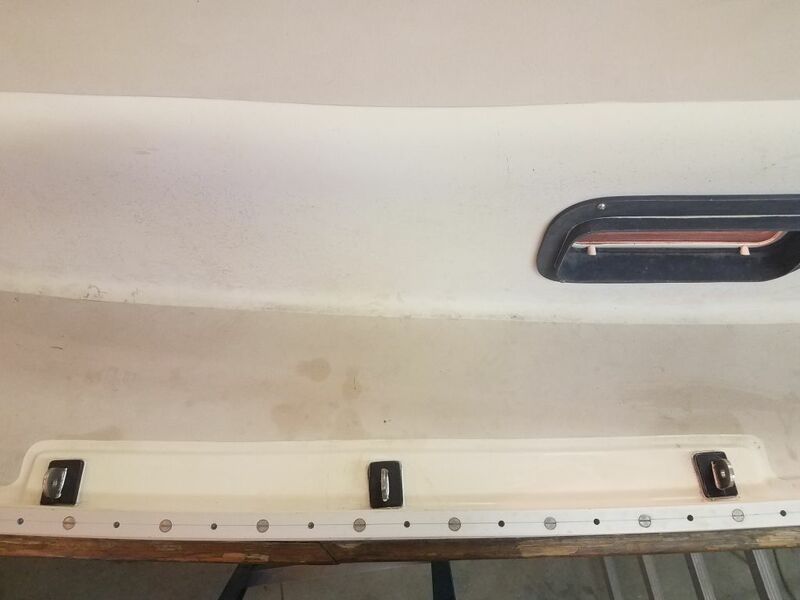 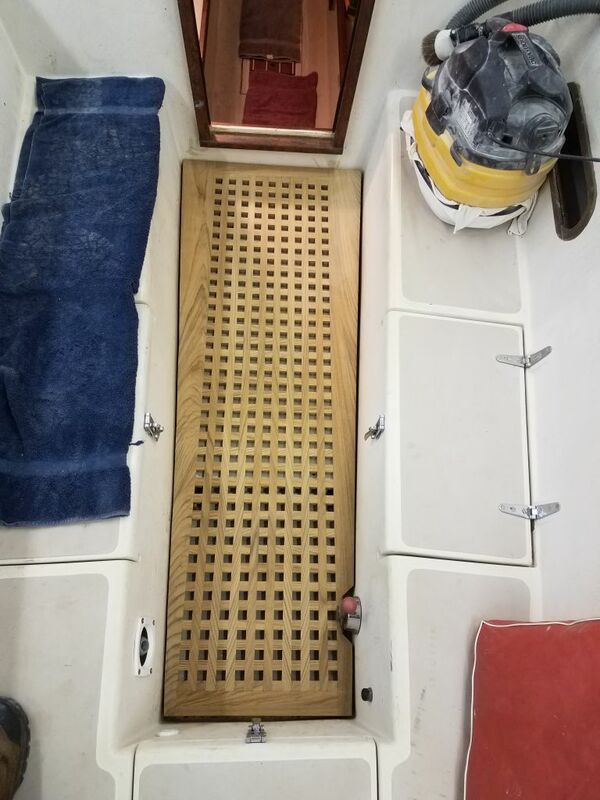 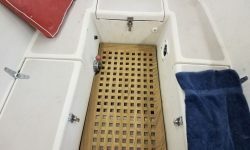 I found that the new grate was a close fit, but one long side required a slight trim, and I also had to open up a relief cut (for the cockpit gear lever) at the starboard aft end. 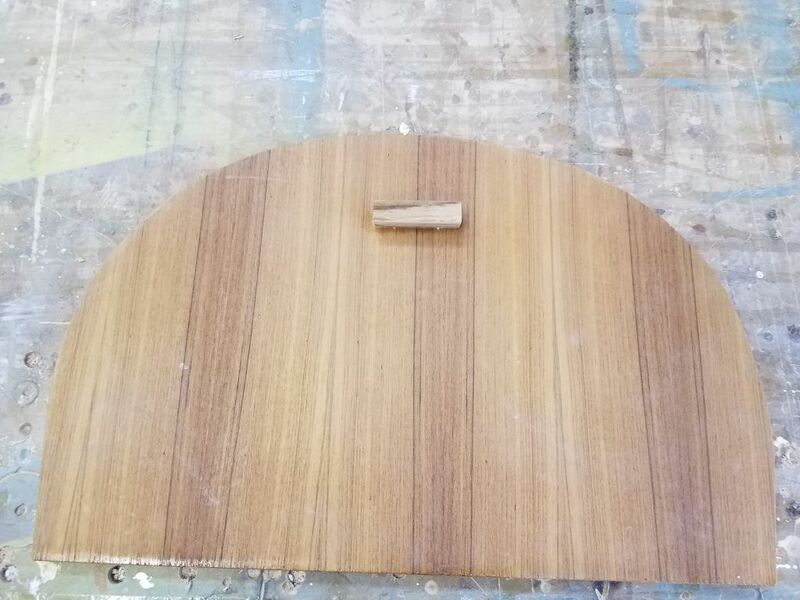 With the cuts completed, I tested the fit, which matched the original as expected. 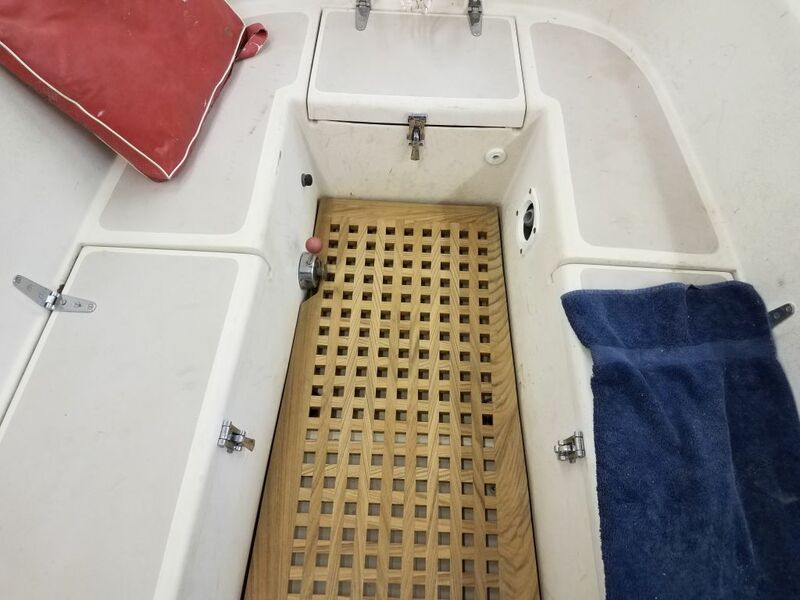 The cockpit sole, with its removable engine hatch and short fixed aft section, was not quite all at one level, which is why the cleats had originally been added to the old grate. 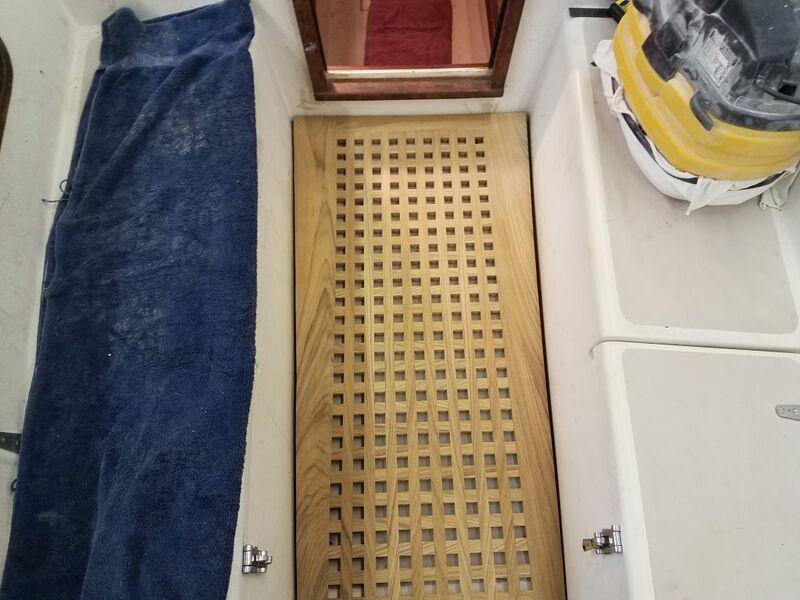 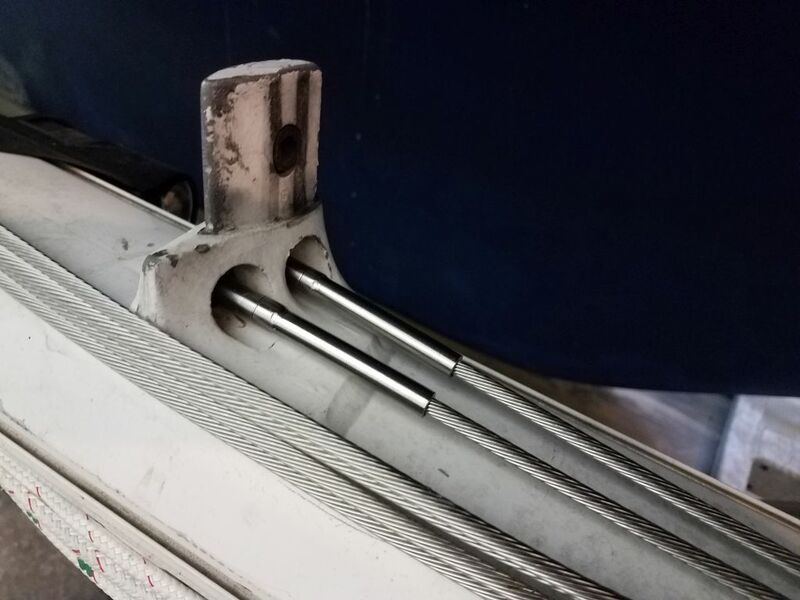 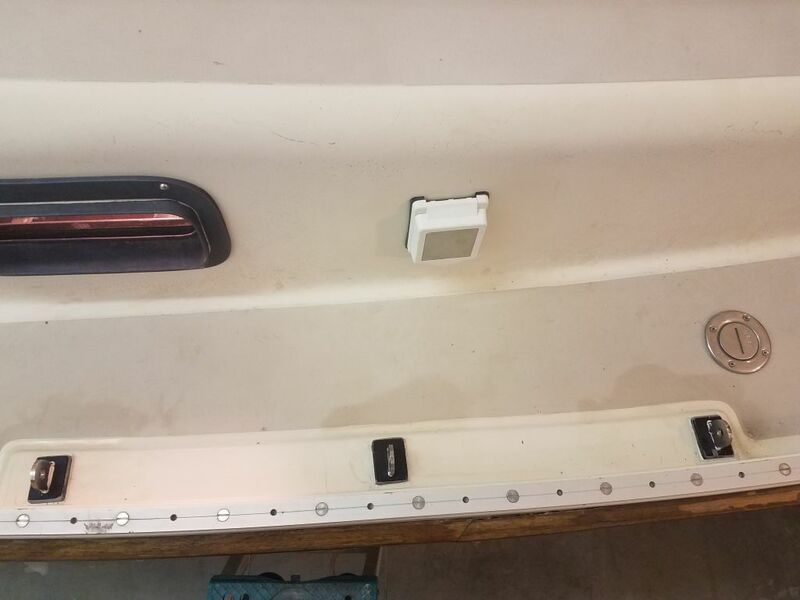 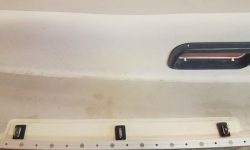 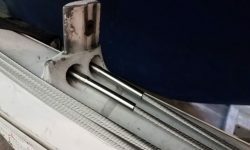 After checking the fit of the new grate, I decided I could simplify the cleat system, since the after section was just 3/8″ lower than the forward section, so I milled some cleats of appropriate size and installed them with screws. 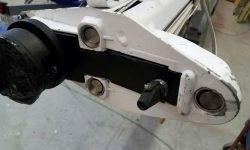 Later, I’d need to slightly relieve the forward portion here and there to accommodate the screw heads that secure the engine hatch in place, since the grate by requirement sat directly above many of these screws, but the old cleat system hadn’t eliminated this need either and had required the same relief cuts. 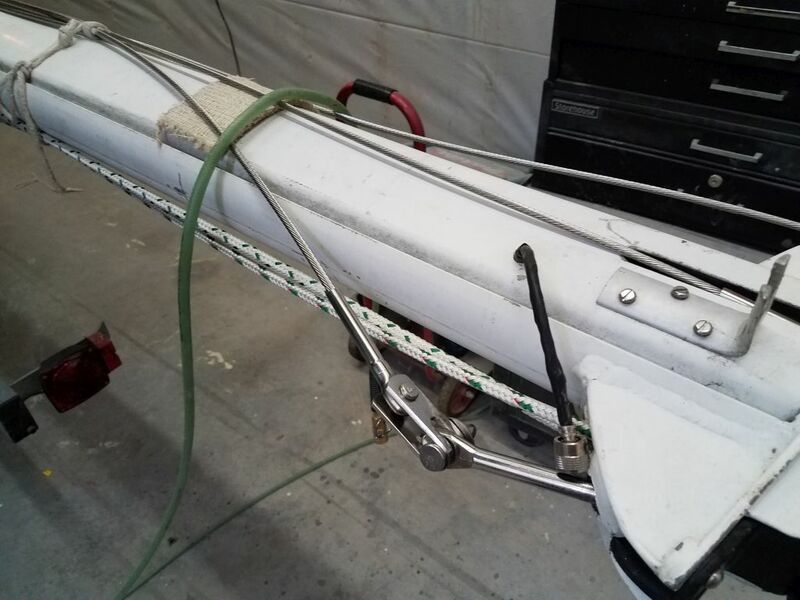 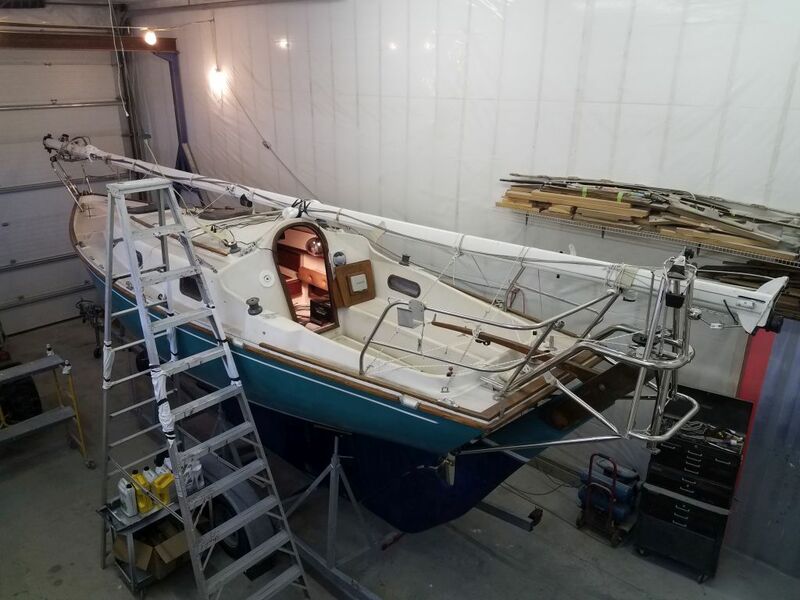 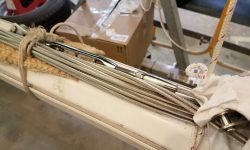 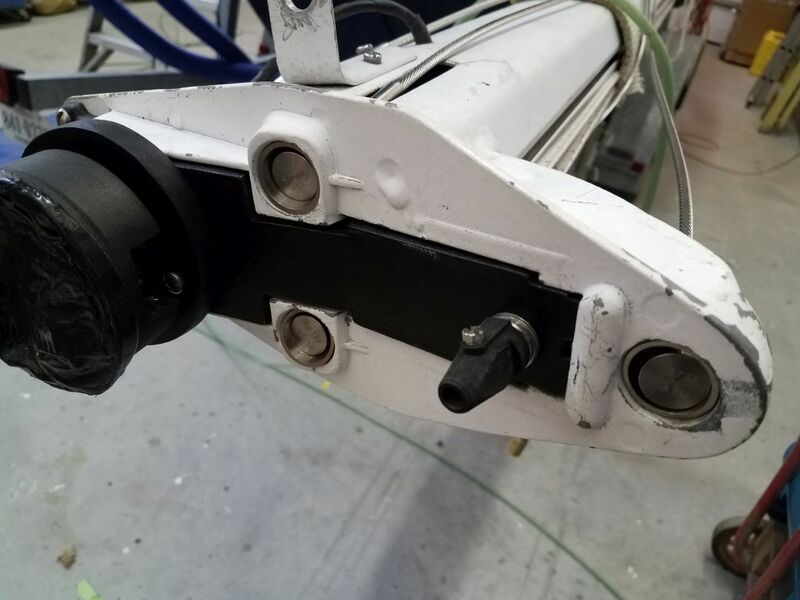 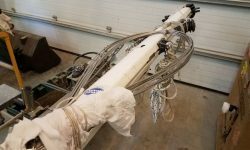 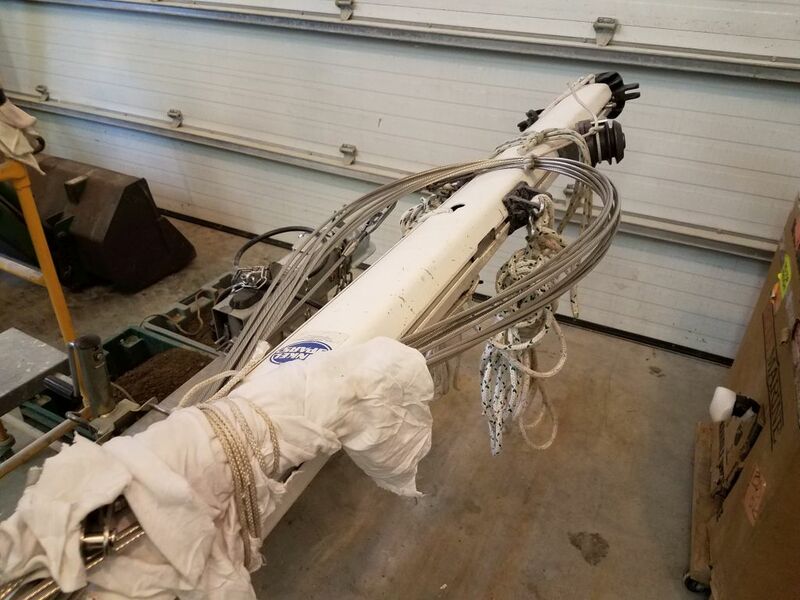 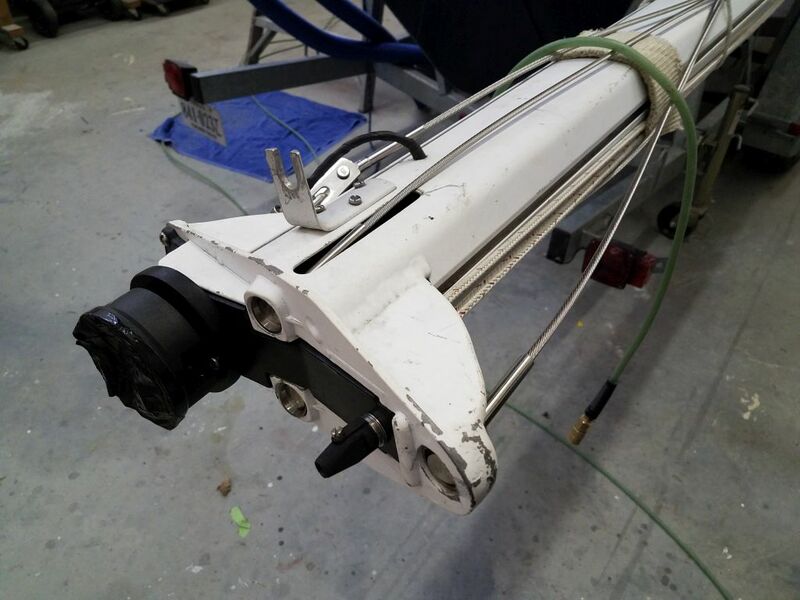 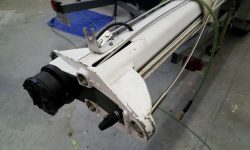 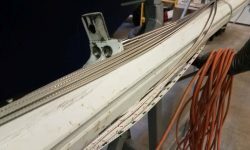 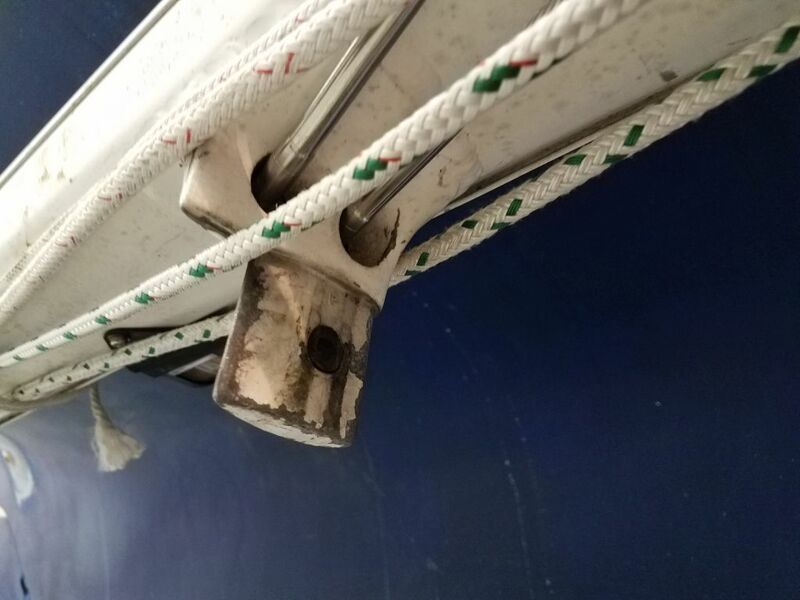 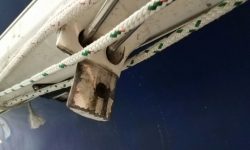 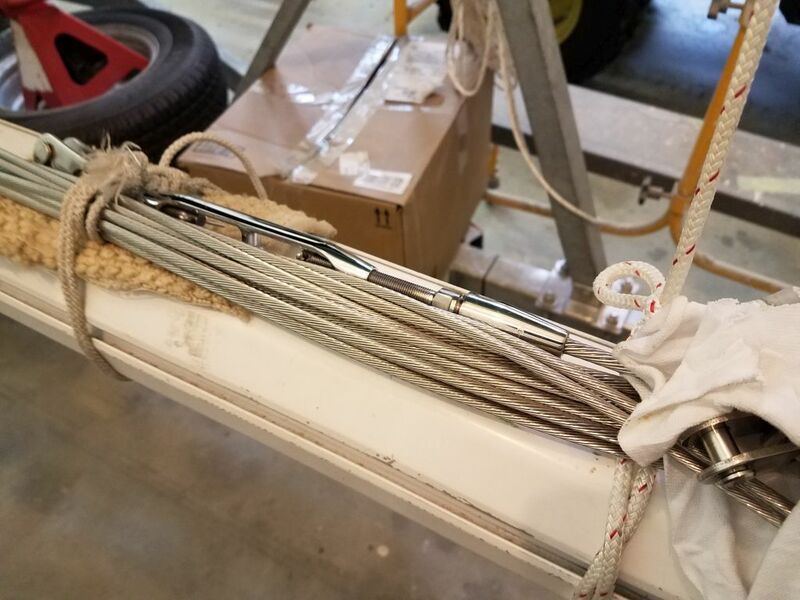 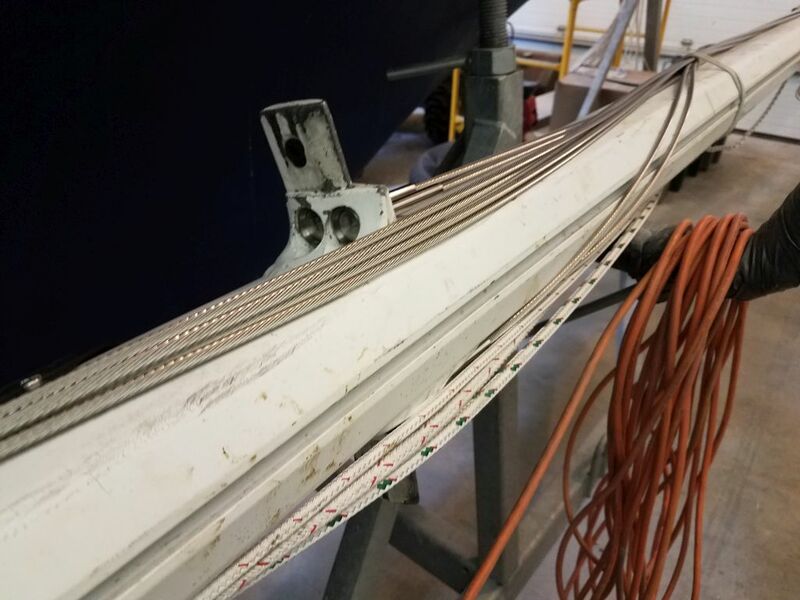 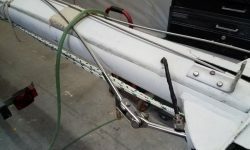 The rigger was on hand during the morning to install and complete the new standing rigging, which included mechanical bottom terminals which, because of the way the rigging passed through holes in the mast, had to be installed on site. 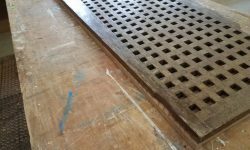 I was away from the shop for a while on other business, but upon my return I decided to finish up the chainplates by trimming the excess sealant from around the new deck covers.